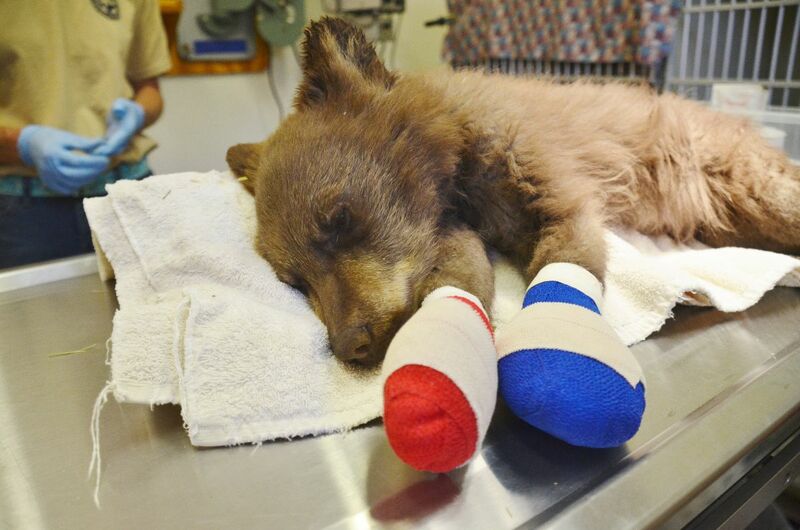 This cub was injured in the forest fire near Durango, Colo., last summer. This photo is from June 2018. The bear is healed and was placed back in the wild in a human-made den on Jan. 25. DURANGO — The bear cub injured in the 416 forest fire in Southwest Colorado last summer is now back in the wild, hibernating in a “den” in the mountains west of Durango. “On Friday, Jan. 25, the bear and another female cub orphaned in the Durango area were placed together in an ideal location — deep in the forest where they’ll find plenty of food when they wake from hibernation,” Colorado Parks and Wildlife spokesperson Joe Lewandowski wrote in a news release. Wildlife officers captured the bear June 21 after receiving reports from firefighters that a cub was wandering alone in a burn area about 15 miles north of Durango. The bear’s feet were badly burned and her mother had not been seen in the area when wildlife officers rescued her from the area near the 416 fire. The cub was taken to Frisco Creek, the wildlife rehabilitation facility operated by Colorado Parks and Wildlife near Del Norte. The bear’s feet were badly burned, and her mother had not been seen in the area; she was born early in 2018 and weighed only about 10 pounds when captured. Wildlife rehabilitators mimicked, as much as possible, the conditions an animal will face in the wild to prepare the cub for a successful release. The 416 bear living in a secure enclosure with 11 other bears helped them develop physically and socially. “So, for bears at Frisco Creek, that means that contact with humans is minimized. Bears live in a secure enclosure with other bears, which helps them to develop physically and socially. Large tree branches, stumps, boulders, platforms, and metal shelters allow the bears to develop the skills they need to survive in the wild,” Lewandowski said. The bears are also fed in a way that imitates life in the woods. “During summer and fall in the wild, food is abundant, and bears eat almost constantly in order to put on the fat they need to get them through the winter,” Lewandowski said. The cub from Durango joined 11 others at the facility that all grew to about 100 pounds. On Friday, the container-den of the 416 bear, now weighing in at 90 pounds, and her companion was closed and taken by truck to the remote trailhead, where it was loaded on a snow-cat and hauled deep into the mountains to a location selected by wildlife officers. A wildlife officer covers the artificial den with hay bales, pine boughs and snow. The artificial den of the 416 bear and her companion was taken by truck to a remote trailhead where it was loaded on a snow-cat and hauled deep into the mountains. The den was placed and covered with hay bales, pine boughs, and snow. Within a few weeks a wildlife officer will go back to the site and remove the den door. “When the weather warms, she and her crate mate will emerge into good black bear habitat — and they’ll be wild bears again,” Lewandowski said. Bears usually emerge from hibernation in mid-April.